Data visualization is the key to understand the outcome of any solution regardless of domain. It brings more statistical inferences from understanding the data, exploring the various patterns among the data and more towards the model understanding results. Data visualization tools is one of the main areas where any person can get into the core understanding of the relationships. Nowadays it is more widely used in business meetings, stakeholders which make them easily identify the core value of the product. 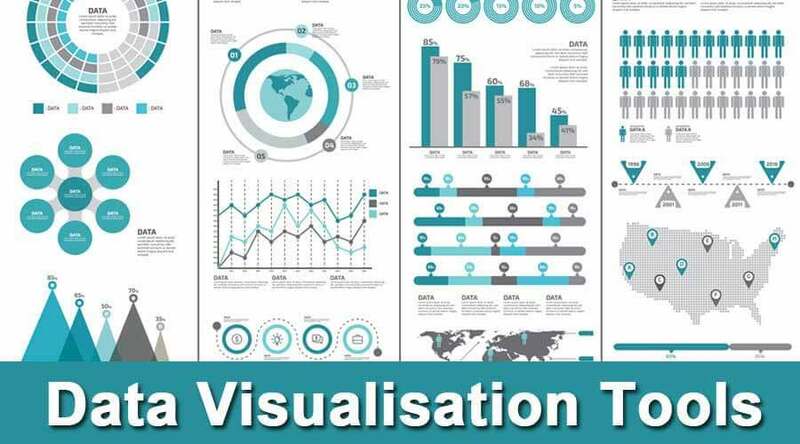 What is Data Visualisation Tools? There are numerous data visualization tools such as Tableau, QlikView, FusionCharts, HighCharts, Datawrapper, Ploty, D3.js, etc. Though there are humungous data visualization tools used in day to day life in Data visualization, One of the most popular plotting tools is matplot.pyplot. Matplotlib is one of the most important plotting libraries in python. The whole plotting module is inspired by plotting tools that are available in MATLAB. The main reason is a lot of people come from the areas of Mathematics, Physics, Astronomy, and Statistics and a lot of Engineers and Researchers are used to MATLAB. matplotlib.pyplot is used widely in creating figures with an area, plotting the lines and we can do visualize the plots attractively. 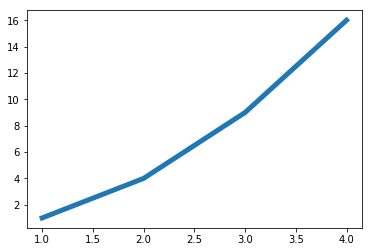 The above is a list, plt.plot will plot these list elements of Y-axis which is indexed at 0,1,2,3 as their corresponding X-axis. The above line of code will give the title to the plot. The title tells us what the plot is all about. There is one problem with the above plot(screenshot 1), if you have noticed, we don’t see a grid-like structure. A grid helps you to read the values from the plot much more easier. Now let’s see how to get the grid. Look at the above line of code, instead of giving one array, we have two lists which becomes our X-axis and Y-axis. 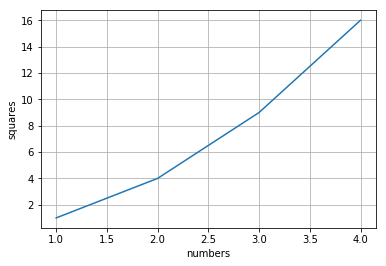 Here you can notice is, if our x-axis value is 2 it’s corresponding y-axis value is 4 i.e, y-axis values are the squares of x-axis values. Now instead of line plot, We plot a different plot with a different example. Every X, Y pair has an associated parameter like the color and the shape which we can give accordingly using the functionality of the python keyword pair argument. In this case, ‘ro’ indicates r – red color and o – circle shaped dots (as shown in screenshot 3). Above line creates values from 0 to 5 with an interval of 0.2. The above line of code adds legends based online label. Legends make the plot extremely readable. Lets understand some more properties. If we want the line width to be more, then a simple parameter called linewidth can do it. There are many other various parameters available which you can have at the documentation of plot function in matplotlib.pyplot(https://matplotlib.org/api/pyplot_api.html). The other interesting thing is set properties. By using the above line we can plot these values in a single line. So what happens here is it will plot X1 vs Y1 and X2 vs Y2 and we are storing these in a variable called lines. Also we can change the properties of those lines using keyword arguments. Here setp is called as set properties ,lines corresponding to X1,Y1 respectively, color and linewidth are the arguments.The above line of code is written using keyword arguments (refer screenshot 6). The above line of code represents the matlab syntax . Here lines corresponds to X2, Y2 respectively. We also have two pairs of arguments ‘colour’,’g’ and ‘linewidth’,’2.0’ (refer screenshot 6). Either of the way we can plot the line. The first way is the native way of how we use in python. The second way is preferably used by the people from the MATLAB background.